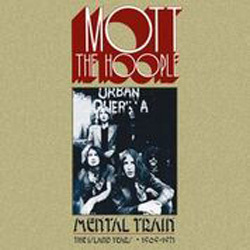 An expansive, six-CD box set, ‘Mental Train’ features the four Mott The Hoople studio albums recorded by the classic line-up of Ian Hunter, Mick Ralphs, Verden Allen, Overend Watts and Dale Griffin and released by Island Records between December 1969 and November 1971, together with a twelve-track CD cunningly titled ‘The Ballads Of Mott The Hoople’ (“unheard and unreleased music from the Island archive”) and a final CD of live material. 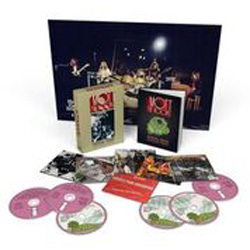 A lot of what’s in the set will be familiar to fans – the live CD is the September 1970 Croydon Fairfield Halls material again, topped up with the December 1971 BBC ‘In Concert’ material – but it’s worth noting that the four albums have all been augmented with eight or nine outtakes and demos, bringing the song count to a stonking eighty-nine tracks. Released in November 1969, ‘Mott The Hoople’ was an interesting affair, with a fifty/fifty split between covers and originals. Driven by Ralphs’ guitar, an instrumental version of ‘You Really Got Me’ made for an exciting opener, the song being cut in half and used to end the original album under the title ‘Wrath And Roll’. The story goes that once the album was finished maverick producer Guy Stevens was concerned that it was composed of too many slow songs, so pretty much to order Ralphs knocked off ‘Rock And Roll Queen’. Hunter’s sole contribution was ‘Backsliding Fearlessly’, Ralphs had already supplied ‘Rabbit Foot And Toby Time’ and together they came up with ‘Half Moon Bay’. The US press was much more in tune with ‘Mott The Hoople’ than their UK counterparts, although the band were soon becoming known for their frenetic gigs. Unusually for the early Seventies, their second album didn’t appear until almost a year had passed. Recording had started the same month that the band’s debut album had appeared, but continued in an on-off fashion with the bulk of the work taking place during February to March 1970. On its release in September 1970, ‘Mad Shadows’ was found to be a dark affair, and much more a band effort – no covers this time around: five from Hunter and two from Ralphs – than its predecessor. A working title of ‘Sticky Fingers’, stolen from The Rolling Stones who’d ditched it in favour of ‘Let It Bleed’, had to be dropped with Mick ‘n’ Keef reverted to Plan A and so ‘Mad Shadows’ it was – a much more fitting title, to be fair. It did better in the charts than its predecessor, with a two-week run peaking at No.48 rather than in-and-out at No.66, but Island Records would have been hoping for much bigger things than this. Probably the weakest of the band’s Island catalogue, ‘Wildlife’ is a very safe, pleasant album, pretty much the antithesis of its predecessor, and was self-produced. Following ‘Mad Shadows’ into the shops only six months later, it’s as mixed up as the mixed-up kid of Hunter’s song, and not the album you’d expect from a band whose live shows were raucous, manic affairs. It came up short, too, so ‘Wrong Side Of The River’, an outtake from the ‘Mad Shadows’ sessions, was added; and from a proposed live album recorded in Croydon in September 1970 but scrapped as Stevens thought the tapes were unusable came ‘Keep A-Knocking’. ‘Wildlife’ would also spend two weeks in the charts, peaking at No.44, but its legacy was that, when it was released at the end of the year, the band’s fourth album wouldn’t bother the album charts’ compilers at all. ‘Brain Capers’ was the best of Mott The Hoople’s Island years but the least commercially successful. It was the sound of a band just trying to be themselves and not writing for any perceived audience. The band had three self-produced tracks – ‘The Journey’, ‘Mental Train’ and ‘How Long’ – in the can before they realised they were missing Stevens’ ‘magic’ and Allen was despatched to ask him back. Stevens scrapped the three recordings, although all of them would be re-recorded for the album, with ‘Mental Train’ becoming ‘The Moon Upstairs’ and ‘How Long’ morphing into frenetic opener ‘Death May Be Your Santa Claus’. The final day of recording is legendary for its chaos and destruction in Island’s studios, and despite pulling off a majestic album the punters just didn’t seem interested in Mott The Hoople on vinyl. After a disastrous gig in Zurich in March 1972 the band called it a day. ‘Mental Train’ is released on 2 November. My thanks to Verden Allen: the original interview appeared (in Spanish) in ‘This Is Rock’ back in 2009.